"Untitled,” a soda-fired stoneware by Tom Vician, is featured in his exhibit titled “Fowl Play: Elegance and Beauty” through Feb. 28 in Galleries One and Two, located inside and outside of the library at McHenry County College. 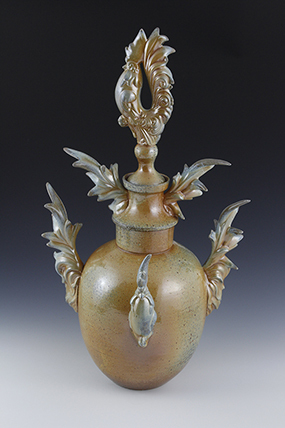 McHenry County College features an exhibit of “Fowl Play: Elegance and Beauty” by MCC ceramics instructor Tom Vician through Feb. 28 in Gallery One and Gallery Two, inside and outside the library, respectively. The college is located at 8900 U.S. Hwy. 14 in Crystal Lake. The exhibit represents a collective interest of both slip-cast, mold-made figures and wheel-thrown vessels, as well as slab-built shapes. Roosters and hens adorn forms reminiscent of early avian-inspired historical works that typically represented good luck and fortune. Vician has been teaching ceramics classes at MCC since 2005, beginning as an adjunct and now full-time instructor. He earned his Bachelor of Fine Arts degree in ceramics from Northern Michigan University and a Master of Fine Arts degree in ceramics from Illinois State University. The college is located at 8900 U.S. Hwy. 14 in Crystal Lake. For more information, call Sandra Lang, gallery curator, at (815) 455-8785 or email her at: slang@mchenry.edu. “Untitled,” a soda-fired stoneware by Tom Vician, is featured in his exhibit titled “Fowl Play: Elegance and Beauty” through Feb. 28 in Galleries One and Two, located inside and outside of the library at McHenry County College.